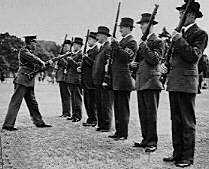 On the 14th May 1940, Sir Anthony Eden launched the Local Defence Volunteer Corps (later the Home Guard). Several of the first volunteers in the Twickenham area discovered that they were all Freemasons. The spirit which had prompted them to resist Hitler's aggression inspired them to form a new Lodge to be called the "Middlesex Home Guard" - the word 'Service' being substituted for 'Guard' (with it's military connotations) at the suggestion of Grand Lodge. Legend has it that Middlesex Home Service was allocated No. 5836 on the toss of a coin from Middlesex Century Lodge No. 5837 of Uxbridge. They consoled themselves by claiming to be the 100th Lodge in Middlesex, hence the name Century presumably, and also a mention by Tennyson in his book "Crossing the Bar". It is certainly true that a fictitious Lodge No.5837 was mentioned in various stories by our old friend Rudyard Kipling who also wrote "The Rivers Tale". Twickenham, Kingston and Richmond owe their existence and importance to the river that runs through them and this is depicted in our banner. Although the Lodge was consecrated in Holborn and met in various venues in Hounslow and Teddington until Cole Court opened in 1953 it has always been a Twickenham Lodge at heart. 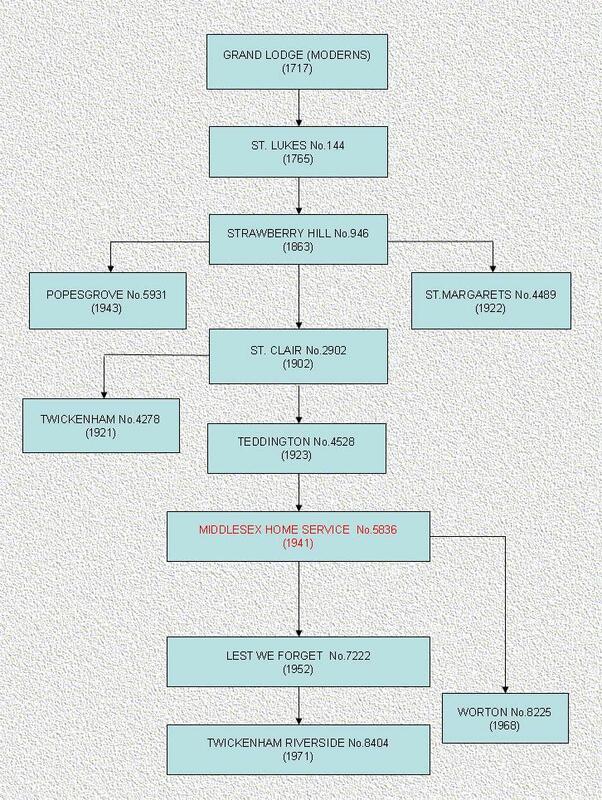 All it's Founders were Twickenham Masons resident in the Borough, and it is only comparatively recently that our members live outside the Borough. The Middlesex Home Service Lodge was founded in the year 1941 when certain brethren serving in the then Home Guard, finding that there were members of various Lodges meeting in the area, decided to form a Lodge to facilitate their meeting and to commemorate their service during those dark days. In their request to Provincial Grand Lodge they stated their reason for wishing to form a Lodge and suggested that it should be called the Home Guard Lodge. This was considered 'inappropriate', but permission was given for the Lodge to be formed with the name of The Middlesex Home Service Lodge. The sponsoring Lodge being The Teddington Lodge No.4528. The new Lodge was consecrated on Tuesday, 10th June 1941 at the Holborn Restaurant, London at 2.30pm. All the above, with the exception of the Tyler, being Founder Members of the Lodge. It was stated at the ceremony that "The title of the Lodge is indicative of the membership inasmuch as it is hoped that future members will be men who had given our country service in some capacity". The badge has been composed as being representative of the districts with which the Founders are connected, embracing the Swords of Middlesex, the Swan of Twickenham, the Lion of Heston and Isleworth, and the Oak Tree of Southall. There were 75 guests present at the Ceremony. The Lodge continued to meet at the Albany hotel, Twickenham until February 1944 when the regular meeting were transferred to the Red Lion Hotel, Hounslow and continued there until September 1951 when the meeting were moved to the new Masonic Centre at Cole court, Twickenham. The Lodge continues to meet at Cole court to this day. A presentation to the Lodge by W.Bro. F. Sprent, of a splendid Banner in memory of his wife, and to commemorate the 21st year of our Lodge. The presentation of a commemorative collar by W.Bro. P. Stroobants to mark the Golden Jubilee, 50th year, of the Lodge on the 12th June 1991. The Lodge has met over two hundred times and initiated over one hundred brethren.